"Über Alles" redirects here. For other uses, see Über Alles (disambiguation). Facsimile of Hoffmann von Fallersleben's manuscript of "Das Lied der Deutschen"
The "Deutschlandlied" (English: "Song of Germany", German pronunciation: [ˈdɔʏtʃlantˌliːt]; officially titled "Das Lied der Deutschen", or "The Song of the Germans"), or part of it, has been the national anthem of Germany since 1922. In East Germany, the national anthem was "Auferstanden aus Ruinen" ("Risen from Ruins") between 1949 and 1990. The music is the hymn "Gott erhalte Franz den Kaiser", written in 1797 by the Austrian composer Joseph Haydn as an anthem for the birthday of Francis II, Emperor of the Holy Roman Empire and later of Austria. 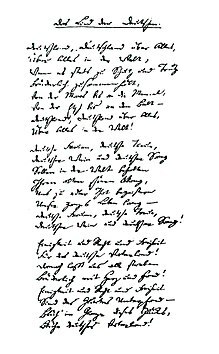 In 1841, the German linguist and poet August Heinrich Hoffmann von Fallersleben wrote the lyrics of "Das Lied der Deutschen" as a new text for that music, counterposing the national unification of Germany to the eulogy of a monarch, lyrics that were considered revolutionary at the time. Along with the flag of Germany, which first appeared in its essentially "modern" form in 1778; it was one of the symbols of the March Revolution of 1848. In order to endorse its republican and liberal tradition, the song was chosen as the national anthem of Germany in 1922, during the Weimar Republic. West Germany adopted the "Deutschlandlied" as its official national anthem in 1952 for similar reasons, with only the third stanza sung on official occasions. Upon German reunification in 1990, only the third stanza was confirmed as the national anthem. The song is also well known by the beginning and refrain of the first stanza, "Deutschland, Deutschland über alles" ("Germany, Germany above all"), but this has never been its title. The line "Germany, Germany above all" meant that the most important goal of 19th-century German liberal revolutionaries should be a unified Germany which would overcome loyalties to the local kingdoms, principalities, duchies and palatines (Kleinstaaterei) of then-fragmented Germany. The melody of the "Deutschlandlied" was written by Joseph Haydn in 1797 to provide music to the poem "Gott erhalte Franz den Kaiser" ("God save Franz the Emperor") by Lorenz Leopold Haschka. The song was a birthday anthem honouring Francis II (1768–1835), Habsburg emperor, and was intended as a parallel to Great Britain's "God Save the King". Haydn's work is sometimes called the "Emperor's Hymn." It has been conjectured that Haydn took the first four measures of the melody from a Croatian folk song. This hypothesis has never achieved unanimous agreement; the alternative theory reverses the direction of transmission, positing that Haydn's melody was adapted as a folk tune. For further discussion see Haydn and folk music. Haydn later used the hymn as the basis for the second movement (poco adagio cantabile) of his Opus 76 No. 3, a string quartet, often called the "Emperor" or "Kaiser" quartet. The Holy Roman Empire, stemming from the Middle Ages, was already disintegrating when the French Revolution and the ensuing Napoleonic Wars altered the political map of Central Europe. However, hopes for the Enlightenment, human rights and republican government after Napoleon's defeat in 1815 were dashed when the Congress of Vienna reinstated many small German principalities. In addition, with the Carlsbad Decrees of 1819, Austrian Chancellor Klemens von Metternich and his secret police enforced censorship, mainly in universities, to keep a watch on the activities of teachers and students, whom he held responsible for the spread of radical liberalist ideas. Since reactionaries among the monarchs were the main adversaries, demands for freedom of the press and other liberal rights were most often uttered in connection with the demand for a united Germany, even though many revolutionaries-to-be had different opinions about whether a republic or a constitutional monarchy would be the best solution for Germany. The German Confederation (Deutscher Bund 1815–1866) was a loose federation of 35 monarchical states and four republican free cities, with a Federal Assembly in Frankfurt. They began to remove internal customs barriers during the Industrial Revolution, and the German Customs Union (Zollverein) was formed among the majority of the states in 1834. In 1840 Hoffmann wrote a song about the Zollverein, also to Haydn's melody, in which he praised the free trade of German goods which brought Germans and Germany closer. After the 1848 March Revolution, the German Confederation handed over its authority to the Frankfurt Parliament. For a short period in the late 1840s, Germany was economically united with the borders described in the anthem, and a democratic constitution was being drafted, and with the black-red-gold flag representing it. However, after 1849 the two largest German monarchies, Prussia and Austria, put an end to this liberal movement toward national unification. August Heinrich Hoffmann von Fallersleben wrote the text in 1841 on holiday on the North Sea island of Heligoland, then a possession of the United Kingdom (now part of Germany). Hoffmann von Fallersleben intended "Das Lied der Deutschen" to be sung to Haydn's tune, as the first publication of the poem included the music. The first line, "Deutschland, Deutschland über alles, über alles in der Welt" (usually translated into English as "Germany, Germany above all, above all in the world"), was an appeal to the various German monarchs to give the creation of a united Germany a higher priority than the independence of their small states. In the third stanza, with a call for "Einigkeit und Recht und Freiheit" (unity and justice and freedom), Hoffmann expressed his desire for a united and free Germany where the rule of law, not monarchical arbitrariness, would prevail. In the era after the Congress of Vienna, influenced by Metternich and his secret police, Hoffmann's text had a distinctly revolutionary and at the same time liberal connotation, since the appeal for a united Germany was most often made in connection with demands for freedom of the press and other civil rights. Its implication that loyalty to a larger Germany should replace loyalty to one's local sovereign was then a revolutionary idea. The year after he wrote "Das Deutschlandlied", Hoffmann lost his job as a librarian and professor in Breslau, Prussia (now Wrocław, Poland), because of this and other revolutionary works, and was forced into hiding until being pardoned after the revolutions of 1848 in the German states. The melody of the "Deutschlandlied" was originally written by Joseph Haydn in 1797 to provide music to the poem "Gott erhalte Franz den Kaiser" ("God save Franz the Emperor") by Lorenz Leopold Haschka. The song was a birthday anthem to Francis II, Holy Roman Emperor of the House of Habsburg, and was intended to rival in merit the British "God Save the King". After the dissolution of the Holy Roman Empire in 1806, "Gott erhalte Franz den Kaiser" became the official anthem of the emperor of the Austrian Empire. After the death of Francis II new lyrics were composed in 1854, Gott erhalte, Gott beschütze, that mentioned the Emperor, but not by name. With those new lyrics, the song continued to be the anthem of Imperial Austria and later of Austria-Hungary. Austrian monarchists continued to use this anthem after 1918 in the hope of restoring the monarchy. The adoption of the Austrian anthem's melody by Germany in 1922 was not opposed by Austria. "Das Lied der Deutschen" was not played at an official ceremony until Germany and the United Kingdom had agreed on the Heligoland–Zanzibar Treaty in 1890, when it appeared only appropriate to sing it at the ceremony on the now officially German island of Heligoland. During the time of the German Empire it became one of the most widely known patriotic songs. The song became very popular after the 1914 Battle of Langemarck during World War I, when, supposedly, several German regiments, consisting mostly of students no older than 20, attacked the British lines on the Western front singing the song, suffering heavy casualties. They are buried in the Langemark German war cemetery in Belgium. The official report of the army embellished the event as one of young German soldiers heroically sacrificing their lives for the Fatherland. In reality the untrained troops were sent out to attack the British trenches and were mown down by machine guns and rifle fire. This report, also known as the "Langemarck Myth", was printed on the first page in newspapers all over Germany. It is doubtful whether the soldiers would have sung the song in the first place: carrying heavy equipment, they might have found it difficult to run at high speed toward enemy lines while singing the slow song. Nonetheless, the story was widely repeated. The melody used by the "Deutschlandlied" was still in use as the anthem of the Austro-Hungarian Empire until its demise in 1918. On 11 August 1922, German President Friedrich Ebert, a Social Democrat, made the Deutschlandlied the official German national anthem. In 1919 the black, red and gold tricolour, the colours of the 19th century liberal revolutionaries advocated by the political left and centre, was adopted (rather than the previous black, white and red of Imperial Germany). Thus, in a political trade-off, the conservative right was granted a nationalistic composition – though Ebert advocated using only the lyrics' third stanza (which was done after World War II). During the Nazi era, only the first stanza was used, followed by the SA song "Horst-Wessel-Lied". It was played at occasions of great national significance such as the opening of the 1936 Summer Olympics in Berlin when Hitler and his entourage, along with Olympic officials, walked into the stadium amid a chorus of three thousand Germans singing "Deutschland, Deutschland über alles". In this way, the first verse became closely identified with the Nazi regime. After its founding in 1949, West Germany did not have a national anthem for official events for some years, despite the growing need for the purpose of diplomatic procedures. In lieu of an official national anthem, popular German songs such as the Trizonesien-Song, a carnival song mocking the occupying Allied powers, were used at some sporting events. Different musical compositions were discussed or used, such as the fourth movement of Ludwig van Beethoven's Ninth Symphony, which is a musical setting of Friedrich Schiller's poem "An die Freude" ("Ode to Joy"). Though the black, red and gold colours of the national flag had been incorporated into Article 22 of the (West) German constitution, a national anthem was not specified. On 29 April 1952, Chancellor Konrad Adenauer asked President Theodor Heuss in a letter to accept "Das Lied der Deutschen" as the national anthem, with only the third stanza being sung on official occasions. President Heuss agreed to this on 2 May 1952. This exchange of letters was published in the Bulletin of the Federal Government. Since it was viewed as the traditional right of the President as head of state to set the symbols of the state, the "Deutschlandlied" thus became the national anthem. Meanwhile, East Germany adopted its own national anthem, "Auferstanden aus Ruinen" ("Risen from Ruins"). As the lyrics of this anthem called for "Germany, united Fatherland", they were no longer officially used, from about 1972, after the DDR abandoned its goal of uniting Germany under communism. With slight adaptations, the lyrics of "Auferstanden aus Ruinen" can be sung to the melody of the "Deutschlandlied" and vice versa. In the 1974 FIFA World Cup in their home country, West German football players remained silent and did not sing their anthem. In the 1970s and 80s, efforts were made by conservatives in Germany to reclaim all three stanzas for the anthem. The Christian Democratic Union of Baden-Württemberg, for instance, attempted twice (in 1985 and 1986) to require German high school students to study all three stanzas, and in 1989 CDU politician Christean Wagner [de] decreed that all high school students in Hesse were to memorise the three stanzas. On 7 March 1990, months before reunification, the Federal Constitutional Court declared only the third stanza of Hoffmann's poem to be legally protected as a national anthem under German penitential law; Section 90a of the Criminal Code (Strafgesetzbuch) makes defamation of the national anthem a crime – but does not specify what the national anthem is. This did not mean that stanzas one and two were not – at that time – part of the anthem at all, but that their peculiar status as "part of the anthem but unsung" disqualified them for penal law protection because the penal law must be interpreted in the narrowest manner possible, and was not explicit in their regard. In November 1991, President Richard von Weizsäcker and Chancellor Helmut Kohl agreed in an exchange of letters to declare the third stanza alone to be the national anthem of the reunified republic. Hence, effective since then, the national anthem of Germany is unmistakably the third stanza of the Deutschlandlied, and only this stanza, with Haydn's music. The opening line of the third stanza, "Einigkeit und Recht und Freiheit" ("Unity and Justice and Freedom"), is widely considered to be the national motto of Germany, although it was never officially proclaimed as such. It appears on Bundeswehr soldiers' belt buckles (replacing the earlier "Gott mit uns" ("God with Us") of the Imperial German Army and the Nazi-era Wehrmacht). "Einigkeit und Recht und Freiheit" appeared on the rim of 2 and 5 Deutsche Mark coins and is present on 2 Euro coins minted in Germany. The first verse, which is no longer part of the national anthem and is not sung on official occasions, names three rivers and one strait – the Meuse (Maas in German), Adige (Etsch) and Neman (Memel) Rivers and the Little Belt strait – as the boundaries of the German Sprachbund. As the song was written before German unification, there was never an intention to deliniate borders of Germany as a nation-state. Nevertheless, these geographical references have been variously criticized as irredentist or misleading. Of these the Meuse and the Adige were parts of the German Confederation during the time when the song was composed. The Belt (strait) and the Neman later became actual boundaries of Germany (the Belt until 1920, the Neman until 1945), whereas the Meuse and Adige were not parts of the German Reich as of 1871. Today, no part of any of the four places mentioned in the "Deutschlandlied" lies in Germany. In an ethnic sense, none of these places formed a distinct ethnic border. The Duchy of Schleswig (to which the Belt refers) was inhabited by both Germans and Danes, with the Danes forming a clear majority near the strait. Around the Adige there was a mix of German, Venetian and Gallo-Italian speakers, and the area around the Neman was not homogeneously German, but also accommodated Lithuanians. The Meuse (if taken as referencing the Duchy of Limburg, nominally part of the German Confederation for 28 years due to the political consequences of the Belgian Revolution), was ethnically Dutch with few Germans. Nevertheless, such nationalistic rhetoric was relatively common in 19th-century public discourse. For example: Georg Herwegh in his poem "The German Fleet" (1841), gives the Germans as the people "between the Po and the Sund (Øresund)," and in 1832 Philipp Jakob Siebenpfeiffer, a noted journalist, declared at the Hambach Festival that he considered all "between the Alps and the North Sea" to be Deutschtum. Despite the text and tune of the song being quite peaceful compared to some other national anthems, the song has frequently been criticised for its generally nationalistic tone, the immodest geographic definition of Germany given in the first stanza, and the alleged male-chauvinistic attitude in the second stanza. A relatively early critic was Friedrich Nietzsche, who called the grandiose claim in the first stanza ("Deutschland über alles") "die blödsinnigste Parole der Welt" (the most idiotic slogan in the world), and in Thus Spoke Zarathustra said, "Deutschland, Deutschland über alles – I fear that was the end of German philosophy." The pacifist Kurt Tucholsky was also negative about the song, and in 1929 published a photo book sarcastically titled Deutschland, Deutschland über alles, criticising right-wing groups in Germany. German grammar distinguishes between über alles, i.e. above all else [for me], and über allen, meaning "above everyone else." However, the latter misleading translation was chosen by the Allies during both World Wars for propaganda purposes. German president Theodor Heuss, upon request from chancellor Konrad Adenauer, declared the Lied der Deutschen the national anthem of the German Federal Republic in May 1952, along with the provision that only the third verse was to be sung at official occasions. The declaration was a compromise between Heuss, who wanted to retain only the third verse, and the Cabinet's wish to keep the first two verses. As a result, the Lied (implicitly in its entirety) was declared the national anthem, with the provision that the third verse would have precedence. As described above, this changed in 1991; since that date, the first and second stanza are no longer "part of the anthem but unsung officially", but nothing more (or less) than stanzas of a song written by a German poet to a well-known tune which people may well sing if they wish (the idea which is sometimes encountered that they have been forbidden is wrong), but without any official status at all. In 1977, German pop singer Heino produced a record of the song, including all three verses, for use in primary schools in Baden-Württemberg. The inclusion of the first two verses was met with criticism at the time. After German reunification in 1990, the German national anthem was redefined as the third verse of the song only. In 2009, Pete Doherty was supposed to sing the German national anthem live on radio at Bayerischer Rundfunk in Munich. As he sang the first verse, he was booed by the audience. Three days later Doherty's spokesperson declared that the singer was "not aware of the historical background and regrets the misunderstanding". A spokesperson for Bayerischer Rundfunk welcomed the response, stating that otherwise further cooperation with Doherty would not have been possible. When the first verse was played as the German national anthem at the canoe sprint world championships in Hungary in August 2011, German athletes were reportedly "appalled". Eurosport, under the headline of 'Nazi anthem', erroneously reported that "the first stanza of the piece [was] banned in 1952." Similarly, in 2017, the first verse was mistakenly sung by Will Kimble, an American soloist, during the welcome ceremony of the Fed Cup tennis match between Andrea Petkovic (Germany) and Alison Riske (USA) at the Center Court in Lahaina, Maui, Hawaii. In an unsuccessful attempt to drown out the soloist, German tennis players and fans started to sing the third verse instead. So wie anderen Völkern ihr's. From the Alps to the North Sea. Max Reger quotes the tune in the final section of his organ pieces Sieben Stücke, Op. 145, composed in 1915/16 when it was a patriotic song but not yet a national anthem. The German musician Nico sometimes performed the national anthem at concerts and dedicated it to militant Andreas Baader, leader of the Red Army Faction. She included a version of "Das Lied der Deutschen" on her 1974 album The End.... In 2006, the Slovenian "industrial" band Laibach incorporated Hoffmann's lyrics in a song titled "Germania", on the album Volk, which contains fourteen songs with adaptations of national anthems. ^ Only the third verse is designated as the official national anthem. ^ Only the third verse was sung on official occasions. ^ Toeche-Mittler, Joachim; Probst, Werner (2013). Dean, Antony; Mantle, Robert; Murray, David; Smart, David (eds.). Tunes of Blood & Iron: German Regimental and Parade Marches from the Age of Frederick the Great to the Present Day. 1. Translated by Dean, Antony; Mantle, Robert; Murray, David; Smart, David. Solihull, England: Helion & Company Limited. p. 16. ISBN 978-1-909384-23-1. ^ "Schwefelhölzer, Fenchel, Bricken (Der deutsche Zollverein)". www.von-fallersleben.de (in German). Retrieved 27 June 2010. ^ Bareth, Nadja (February 2005). "Staatssymbole Zeichen politischer Gemeinschaft". Blickpunt Bundestag (in German). Archived from the original on 6 September 2011. Retrieved 1 December 2009. ^ Mosse, George L. (1991). Fallen Soldiers: Reshaping the Memory of the World Wars. Oxford University Press. pp. 70–73. ISBN 978-0-19-507139-9. Retrieved 25 February 2014. ^ Geisler, Michael E., ed. (2005). National Symbols, Fractured Identities: Contesting the National Narrative. University Press of New England. p. 70. ISBN 978-1-58465-437-7. ^ Geisler 2005, p. 71. ^ "The Triumph of Hitler". The History Place. 2001. Retrieved 9 September 2012. ^ a b c "Briefwechsel zur Nationalhymne von 1952, Abdruck aus dem Bulletin der Bundesregierung Nr. 51/S. 537 vom 6. Mai 1952" [Exchange of letters from 1952 regarding the national anthem, as published in the bulletin of the federal government, Nr. 51/p. 537, 6 May 1952] (in German). Bundesministerium des Innern. 6 May 1952. ^ Dreesen, Philipp (2015). Diskursgrenzen: Typen und Funktionen sprachlichen Widerstands auf den Straßen der DDR [Boundaries of discourse: Types and functions of linguistic resistance on the streets of the GDR]. De Gruyter. p. 135. ISBN 9783110365573. ^ Geisler 2005, p. 72. ^ "Case: BVerfGE 81, 298 1 BvR 1215/87 German National Anthem – decision". Institute for Transnational Law – Foreign Law Translations. University of Texas School of Law / Nomos Verlagsgesellschaft. 7 March 1990. Retrieved 18 January 2015. ^ Bundespräsidialamt. "Repräsentation und Integration" (in German). Retrieved 24 May 2013. Nach Herstellung der staatlichen Einheit Deutschlands bestimmte Bundespräsident von Weizsäcker in einem Briefwechsel mit Bundeskanzler Helmut Kohl im Jahr 1991 die dritte Strophe zur Nationalhymne für das deutsche Volk. ^ A History of Modern Germany: 1800 to the Present (2011) M. Kitchen. ^ a b Malzahn, Claus Christian (24 June 2006). "Deutsche Nationalhymne: 'Die blödsinnigste Parole der Welt'". Der Spiegel (in German). Retrieved 1 December 2009. ^ "Germans Stop Humming, Start Singing National Anthem". Deutsche Welle. 24 June 2006. Retrieved 2 March 2010. ^ Ponsonby, Arthur (1928). Falsehood in War Time: Containing an Assortment of Lies Circulated Throughout the Nations During the Great War (Chapter 11). George Allen and Unwin, London. ISBN 1162798653. ^ Michael Jeismann: "Die Nationalhymne". In: Etienne Francois, Hagen Schulze (ed. ): Deutsche Erinnerungsorte. Vol. III. C.H. Beck, München 2001, ISBN 3-406-47224-9, p. 663. "Natürliches Verhältnis. Deutschlandlied – dritte oder/und erste Strophe? ", Die Zeit, 31 March 1978. ^ Bulletin des Presse- und Informationsamts der Bundesregierung Nr. 89 vom 27. August 1991, p. 713. Bekanntmachung der Briefe des Bundespräsidenten vom 19. August 1991 und des Bundeskanzlers vom 23. August 1991 über die Bestimmung der 3. Strophe des Liedes der Deutschen zur Nationalhymne der Bundesrepublik Deutschland, Bundesgesetzblatt 1991 Part I Nr. 63, p. 2135. ^ "Rockzanger Pete Doherty schoffeert Duitsers". Radio Netherlands Worldwide (in Dutch). 29 November 2009. Archived from the original on 7 June 2011. Retrieved 1 December 2009. ^ "Deutschlandlied, die erste: Skandalrocker Doherty entschuldigt sich für Patzer". Spiegel Online. 1 December 2009. Retrieved 10 August 2015. ^ "'Nazi anthem' played at canoe championship". Eurosport. 22 August 2011. Archived from the original on 29 October 2013. ^ "Nazivolkslied op WK kajak". Het Nieuwsblad (in Dutch). 22 August 2011. ^ Geisler 2005, p. Geisler 75. ^ Rockwell, John (21 February 1979). "Cabaret: Nico is back". The New York Times. ^ Hesselmann, Markus (7 December 2006). "Völker, hört die Fanale!". Der Tagesspiegel (in German). Retrieved 1 December 2009. ^ Schiller, Mike (6 December 2007). "Rev. of Laibach, Volk". PopMatters. Retrieved 1 December 2009. Wikimedia Commons has media related to Deutschlandlied. Daniel A. Gross (18 February 2017). "'Deutschland über alles' and 'America First', in Song". The New Yorker.